Production: Alfred J. Hitchcock Productions; Technicolor, 35mm; running time: 120 minutes. Released 28 March 1963, New York, through Universal Pictures. Filmed mostly on location in Bodega Bay, California. Producer: Alfred Hitchcock; screenplay: Evan Hunter, from "The Birds" by Daphne Du Maurier; photography: Robert Burks; editor: George Tomasini; sound: Remi Gassman and Oskar Sala; sound recordists: Waldon O. Watson and William Russell; sound supervisor: Bernard Herrmann; production design: Robert Boyle; set decoration: George Milo; music: Bernard Herrmann; special effects: Lawrence A. Hampton; costumes: Edith Head; special photography advisor: Ub Iwerks; bird trainer: Ray Berwick. Cast: Rod Taylor ( Mitch Brenner ); Tippi Hedren ( Melanie Daniels ); Jessica Tandy ( Mrs. Brenner ); Suzanne Pleshette ( Annie Hayworth ); Veronica Cartwright ( Cathy Brenner ); Ethel Griffies ( Mrs. Bundy ); Charles McGraw ( Sebastian Sholes ); Ruth McDevitt ( Mrs. MacGruder ); Joe Mantell ( Travelling Salesman ); Doreen Lang ( Hysterical woman ); Malcolm Atterbury ( Deputy Al Malone ); Karl Swenson ( Drunk ); Elizabeth Wilson ( Helen Carter ); Lonny Chapman ( Deke Carter ); Doodles Weaver ( Fisherman ); John McGovern ( Postal clerk ); Richard Deacon ( Man in elevator ); William Quinn. Cameron, Ian, editor, Movie Reader , New York, 1978. Raubicheck, Walter, and Walter Srebnick, eds., Hitchcock's Rereleased Films: From Rope to Vertigo , Detroit, 1991. Cameron Ian, and V. F. Perkins, interview with Hitchcock in Movie (London), January 1963. Bogdanovich, Peter, in Film Culture (New York), Spring 1963. Johnson, Albert, "Echoes from The Birds ," in Sight and Sound (London), Spring 1963. Sarris, Andrew, in Village Voice (New York), 4 April 1963. Foote, Sterling, in Films in Review (New York), May 1963. "Hitchcock on Style: Interview," in Cinema (Beverly Hills), August 1963. Baker, Peter, in Films and Filming (London), September 1963. Belz, Carl, in Film Culture (New York), Winter 1963–64. Hitchcock, Alfred, in Take One (Montreal), no.10, 1968. Cumbow, R. C., "Caliban and Bodega Bay," in Movietone News (Seattle), May 1975. Simper, D., "Poe, Hitchcock, and the Well-Wrought Effect," in Literature/Film Quarterly (Salisbury, Maryland), Summer 1975. Rose, J., "Paranoia and the Film System," in Screen (London), Winter 1976–77. Weis, Elisabeth, "The Sound of One Wing Flapping," in Film Comment (New York), September-October 1978. Nichols, Bill, " The Birds: At the Window," in Film Reader (Evanston, Illinois), no. 4, 1979. Bergstrom, J., "Enunciation and Sexual Difference," in Cinema Obscura (Berkeley), Summer 1979. Bikacsy, G., "Alfred Hitchcock," in Filmkultura (Budapest), September-October 1979. Counts, Kyle B., "The Making of Alfred Hitchcock's The Birds ," in Cinefantastique (Oak Park, Illinois), Fall 1980. Krohn, B., and others, in Cahiers du Cinéma (Paris), June 1982. Horwitz, Margaret M., "A Mother's Love," in Wide Angle (Athens, Ohio), vol. 5, no. 1, 1982. Kapsis, Robert E., "Hollywood Filmmaking and Reputation Building: Hitchcock's The Birds ," in Journal of Popular Film and Television (Washington, D.C.), Spring 1987. Girard, M., " The Birds ," in Séquences (Quebec), no. 169, February 1994. Silet, Charles L.P., "Writing for Hitch: An Interview with Evan Hunter," and Christopher Sharrett, "The Myth of Apocalypse and the Horror Film: The Primacy of Psycho and The Birds ," in Hitchcock Annual (New London, New Hampshire), Fall 1995–96. Allen, R., "Avian Metaphors in The Birds ," in Hitchcock Annual (New London, New Hampshire), Fall 1997–98. Vest, James M., "Echoes of Alfred Hitchcock's Vertigo , The Birds , and Frenzy in Francois Truffaut's Story of Adèle H. ," in Hitchcock Annual (New London, New Hampshire), Fall 1997–98. Of The Birds , Peter Bogdanovich has written, "If (Alfred Hitchcock) had never made another motion picture in his life, The Birds would place him securely among the giants of the cinema." 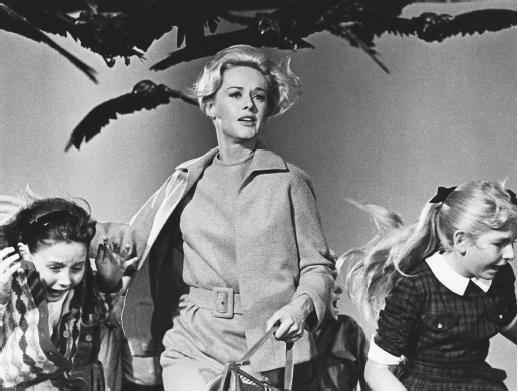 Released in 1963, The Birds is one in a series of Hitchcock collaborations with composer Bernard Herrmann, cinematographer Robert Burks, and editor George Tomasini. It was also the director's first film featuring actress Tippi Hedren, who would later star in Marnie , perhaps the most critically controversial film of Hitchcock's career. The Birds seems to be a film which functions as a Rorschach test, in which every critic sees something different, and of which virtually anything can be said. It has been discussed as a generic work of horror which inaugurated a whole series of apocalyptic films; as a film of special effects and state-of-the-art matte work representing the ingenuity of Hollywood; as the most sophisticated example of Hitchcock's ability to manipulate his audiences and to play upon the spectators' fears; as a profound and personal work concerning human frailty and the importance of commitment in human relationships; as a philosophical treatise—influenced by Kafka and Poe—on the existential human condition; as a structural work examining the point-of-view shot and its relationship to the gaze of the spectator; as a repository of psychoanalytic ideology and meanings; and as the American film most influenced by and celebrative of the montage theories promulgated by the Russian cinema theorists. That this film has been interpreted in so many ways, that the memory of it remains so strong for so many filmmakers and critics, and that the film continues to excite and provoke new generations of filmgoers, are the surest signs that The Birds is indeed a great and lasting film. Those who see the film for the first time may be surprised by the strength of their visceral response, but those who view the film an additional time are inevitably surprised by how much of the film has actually little to do with bird attacks and takes, instead, the relationships between human beings as its subject. Certainly The Birds contains some of the most disturbing and almost surrealistically beautiful images Hitchcock has ever put on film; the children's party disrupted by a bird attack; the camera's treatment of Tippi Hedren as a fetish object; the surprising aerial view of Bodega Bay which shows the city from the birds' point of view; the three virtually still shots— each catching a discreet moment of time—of Tippi Hedren watching helplessly through the window of a cafe; and, especially, the final exterior scene, poetic and mysterious, aided by the extraordinary matte paintings of Al Whitlock, as the protagonists drive off into an unearthly bird-populated landscape and an uncertain future.